So last night, 06.10.10, was the one and only Philly Beer Week (PBW) event I got to attend, Older Bud No Weiser, at World CafÃ© Live. The event was kind of pimped as a class reunion for the class of 1996 local brewers. In attendance was Tom Kehoe of Yards, Gene Muller of Flying Fish, Mark Edelson of Iron Hill, Bill Covaleski of Victory, and Sam Calagione of Dogfish Head and it was hosted by Greg Koch of Stone. Thatâ€™s some serious brewing power-house-age right there, and they all basically opened within a year of each other, crazy. 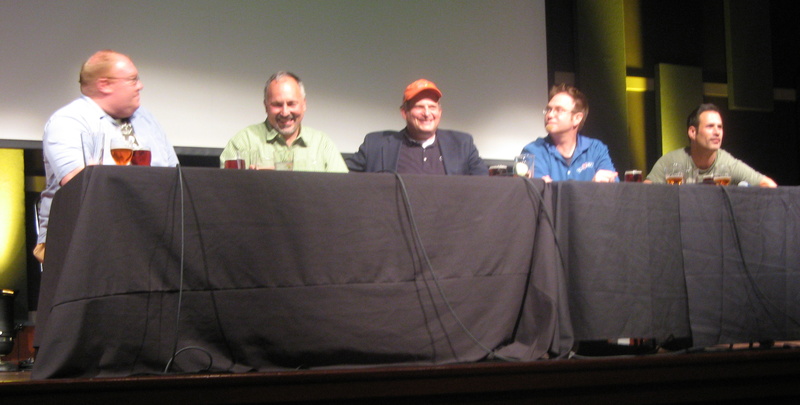 The event was more or less set up like a panel with the five guys behind a long table and Greg off to the side emceeing. He would basically lob easy questions up that all five would answer, like: tell us how you started, what piece of advice would you give yourself in 96 if you knew what you knew now, and tell us a funny/embarrassing story kind of thing. After Greg was done with his questions and everyone was warmed up he turned the questions over to the people on the floor, us. We then were able to ask direct questions to a single person or ask the panel a question. They were cool and kicked down bottles of beer to the people who asked questions. Not knowing what you would get, the beers varied from 11 year old barleywines, to 750mls of specialty brews, to unlabeled secret stash brews. The event ran for about three hours. While the event was going on we also got to sample beers from all five breweries. From Yards I believe we had their ESA, Abbey Dubbel from Flying Fish, Pig Iron Porter from Iron Hill, HopDevil from Victory, and Shelter Pale Ale from DFH. All of the beers were 12oz pours, so it was a nice bit of beer in that three hour time frame. It would have been nice if some small bites were available with the beers, but for $25 I already felt as if it were a bargain price. Also, I was smart enough to eat prior to the event, the website only indicated â€˜light fare will be servedâ€™, but I didnâ€™t trust it. I think overall for only being able to go to one event I was able to go to a pretty decent one. Donâ€™t get me wrong, I would have rathered have gone to one every night for all 10 days of PBW, but alas it wasnâ€™t in the stars this year. Plus with 1000 different events, it was a little daunting to figure out which event(s) were going to be the best to go to. I think it may benefit PBW to stream line some next year, for example the event last night was maybe only half sold out, and I think that was because people had so many other options of great things to do to choose from. This entry was posted on Friday, June 11th, 2010 at 2:13 pm	and is filed under Beer, Side Trip. You can follow any responses to this entry through the RSS 2.0 feed. You can leave a response, or trackback from your own site.